A bit of everything. Probably mostly contemporary ''in-style'' jewelry. Nature, colors. As I see the beauty that surrounds me, I become inspired to portray that peaceful feeling in my jewelry. Metal clay, all types and sheet metal/wire and recently glass. This piece was inspired by nature--created in the summer when all the flowers were blooming and I saw two beautiful, almost iridescent bluish-green dragonflies near some flowers. 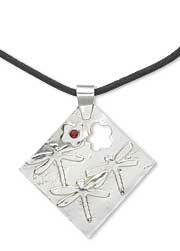 I knew I wanted to create a piece with dragonflies using silver clay, but I wasn't exactly sure what I would do until I actually begin working on the piece. I began making jewelry (simple beading) about six years ago. Visiting our local bead shop, I discovered many gorgeous beads, but I never made jewelry so I wasn't sure what I could do. I was at Borders Bookstore one day and came across ''Beaded Thongs'' which are actually bookmarks made with string and beads. I figured I could do that, giving myself the opportunity to purchase and use all of those gorgeous beads. After several trips to the bead store, the owner suggested I try my hand at making jewelry rather than just bookmarks. I decided to go for it. My goal and dream is to make jewelry to be worn by actors and actresses while filming, but I am not really sure how to go about making this happen. The owner of our local bead shop here in Eureka, California. Her name is Arby. No actually, I am a certified English teacher and when I became unemployed, I decided to try selling my jewelry. My husband and I were on vacation and the prior guests had left a Fire Mountain catalog behind. I had been making jewelry for only about one week at that time. Yes, online only. Precious Metal Clay (PMC) Guild and Beading Daily. Reading, scrapbooking, camping, playing and creating with my grandchildren, gardening, baking. I make jewelry daily. I love it, absolutely! I have a kiosk at our local mall, where I sell my jewelry (but business is extremely slow) and a website (which needs to be updated) if I am not able to create for a few days, I feel absolutely lost. This is my first contest, I did a few fairs this past summer and I have the kiosk at the mall and the website. Yes, Breast Cancer Awareness and mental health for teens. I have also donated a few pieces for local events. Create--create--create--from the heart!! My husband keeps telling me ''You need to make this or that'' but what I need to make is what my heart and hands desire--and I do exactly that. View all of Margo's designs in the Gallery of Designs.